This page lets you configure and monitor the log file writer. If Buffer logging data is enabled on the General tab, then whenever VPOP3 wants to write data to a log file, it does not write it directly. Instead it stores it in memory and a background process (the log file writer) writes the data to disk in chunks. This helps performance because it reduces disk activity. The Enable logging to file option should be turned on. If this is turned off, then the log file writer will simply discard log entries, and they will never be written to disk! In general, it is better to disable specific logging options on the General and Session Logs tabs instead. The next section configures how often the background writer will write a chunk of log data to disk. The longer between writes the less disk load there will be, but the more chance that a crash will cause log data to be lost and the more RAM will be used by the buffered data. VPOP3 has an internal counter which is the time between write bursts. The current value of this is displayed as Current time between log writer bursts. VPOP3 adjusts this time based on activity. •Min time between log writer bursts - this sets the lowest value for the time between write bursts. •If lines written < X then increase time between bursts by Y ms - if there are fewer than X lines to be written when the log writer performs a write action, then the time to the next write action will be increased by Y milliseconds. This means that if activity lessens, VPOP3 will wait longer between write bursts. The time will never increase to more than the Max time between log writer bursts value. •If lines written > X then decrease time between bursts by Y ms - if there are more than X lines to be written when the log writer performs a write action, then the time to the next write action will be decreased by Y milliseconds. This means that if activity increases, VPOP3 will wait less time between write bursts. The time will never decrease to less than the Min time between log writer bursts value. •Only write to disk if at least X lines waiting to be written - If there are fewer than X lines waiting to be written to a log file, then the log file writer will skip writing to that log file for now. •Always write if oldest line is over Y ms old - even if there are too few lines waiting (as defined above), then the log file writer will still write them to disk if they are older than this. This prevents log files which only occasionally get new entries from never being written to disk. Below this is the Log file stats. 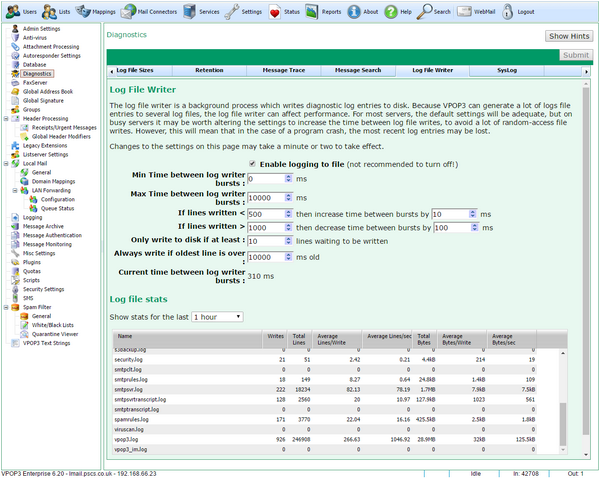 This section shows you how often each log file is written to. This can help with diagnosing issues with heavy disk load in some cases. For instance, in the above screenshot you can see that the VPOP3.LOG is heavily used, with 125kB being written each second to that file. This is because we have enabled Full Logging in the diagnostics General tab, so VPOP3 is writing a detailed log file. If we had disk performance issues it would help to reduce the log level to reduce the amount of data being written. (In our case this isn't necessary because VPOP3 is writing logs to a RAM disk whose performance is extremely quick).